WAFFLES: Hey Boss! Did you know they made a movie about my breakfast? KATIE: Waffles, you do know the star of that movie was a GIRL, don't you? A very glamorous girl. Who made big sunglasses and diamonds all the rage. SOPHIE: So, where's the breakfast? It was that orange cat, wasn't it? Never trust a cat in sunglasses. Sophie is a beautiful tabby girl with pretty orange accents. We think that makes her a "Torbie." Sweet, quiet and friendly, this beautiful girl is eight years old. Her cage card reads, "released by her owners." That just breaks our hearts. We can't understand how after eight years, or eight hours for that matter, anyone could surrender their cat to a shelter. 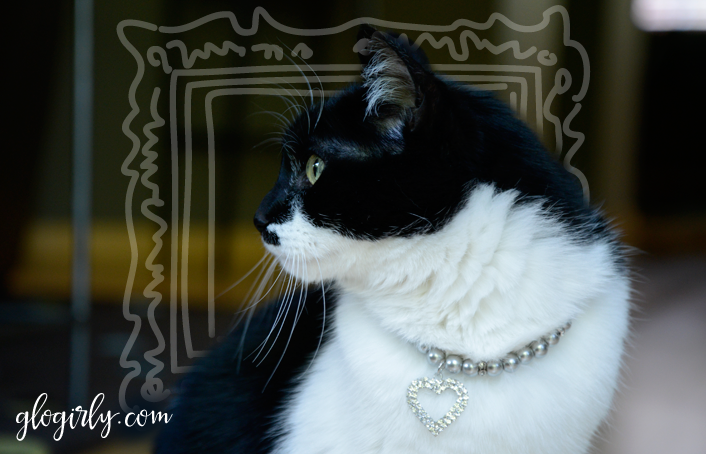 Our pets are part of our families. Adoption is for life. We can't imagine what Sophie must have thought happened. We are hoping and praying that someone will come along who has room in their forever heart and their forever home for sweet Sophie. 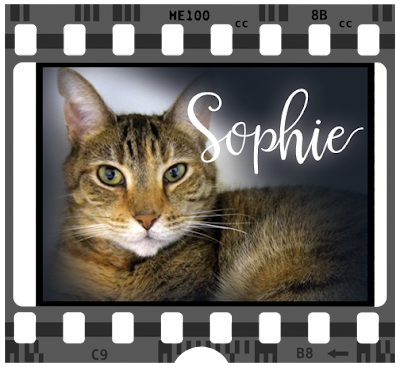 Sophie is waiting patiently for you at PAWS, Pet Animal Welfare Society in Norwalk, CT.
Caturday at the Movies with the Shelter Cats! And Waffles, I do love your breakfast look. The herringbone tweed is sure an interesting variation on the little black dress! Poor Sophie! I really hope someone steps up for her soon. Perfect Caturday film. I love Waffles, Katy and the Glo Family! Sophie's a beautiful girl. Hope she finds her fur ever home soon. 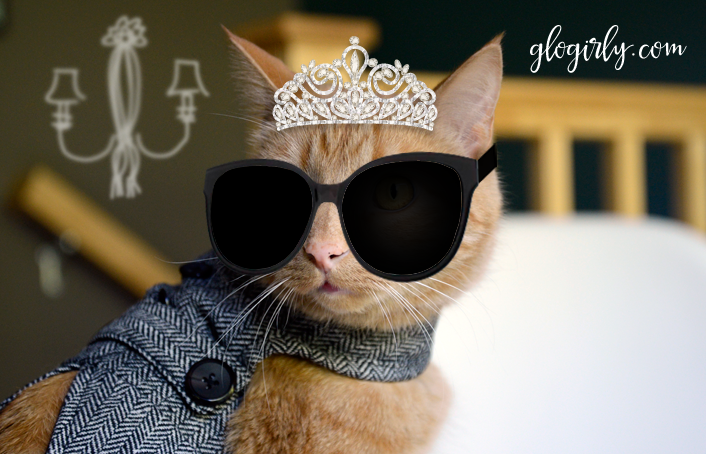 Waffles is rocking the big sunglasses and tiara! MOL! 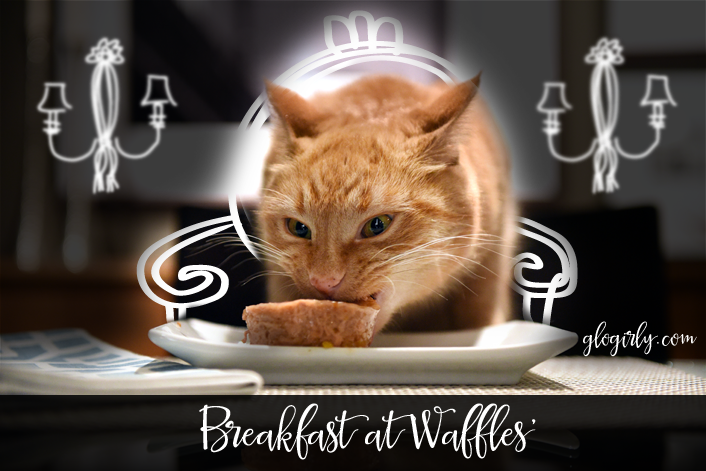 If they ever will do the movie Breakfast at Waffles I would be the first one to go and see it , Waffles ! We sure hope that beutiful Sophie will find a foreverhome ASAP !! 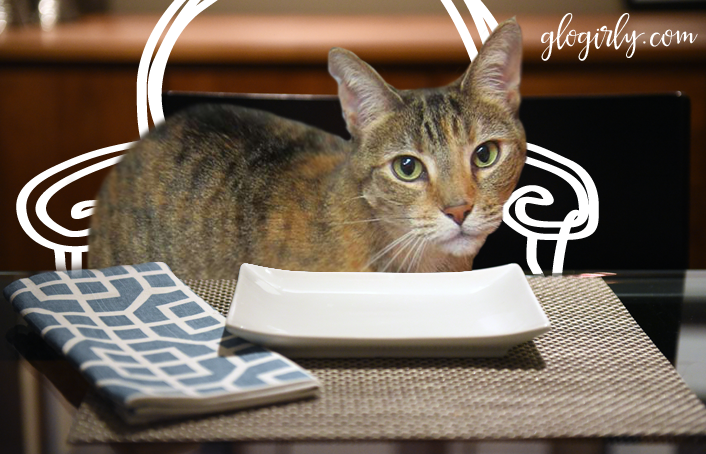 Thank you, Glogirly, Waffles, and Katie for sharing breakfast with Sophie! She's beautiful. Hope she finds a forever home. Sophie is clearly a quick learner! Oh, yeah. And please don't diss all owners who give up their cats. Some have no choice due to aging and/or health issues. Mum says Derby was given up when his person went into a nursing home and wasn't allowed to bring him along. But they did the right thing, at least he went to a shelter where he could find a new home. They didn't just abandon him and leave him on his own. We're very sorry, Ducky. That was not our intent at all. Too many people decide their pets aren't just going to fit into their family any more for what appear to be frivolous reasons. But you are absolutely right, sometimes the circumstances dictate there is no other choice. And surrendering to a shelter is a much better and more humane alternative to simply dumping a cat. Our hearts particularly go out to those people that have had to leave their homes and families as they get older and need more help. We're sorry if we offended. Miss Glogirly, no me is not offended. Just pointing out that we shouldn't assume that the pet was dumped. It may have been a heart breaking decision to let such a lovely lady go. Heck, I got adopted once and when I got out and then found, my first family didn't want me back. So I headed off to better places through the shelter and now I have found paradise with mum. I hope that sweetheart finds a home. Waffles you rock that look. Katie, Waffles is hopeless. Waffles, he he - you are so funny you kill us every week. Sophie - You are a very pretty kitty and we hope you find your forever home very soon. Sophie is a sweet girl and I hope someone will give her a loving forever home. Oh poor poor Soophie. Weez just not know what in da world sum humans awe finkin'. Weez wanna know ifin they wuld dwip off a kid da way they do wiff animals. Weez hope hers furever home is sumwhere close by. Sophie is gorgeous! And yes...she's a torbie. We think of torbies as torties with stripes. :) We can't believe anyone would give her up after all that time. We can't figure out some humans. Sophie, you are gorgeous. We thinks anyone would be lucky to have you for breakfast every day. HAH! Waff is too funny and Sophie and Katie are gorgeous! I can’t believe he ate the whole thing. You take the cake eh, tuna, Waffles.